RBTH presents a selection of views from leading Russian media on international events, featuring reports on U.S. Secretary of State John Kerry’s warning of new sanctions against Russia over the Ukrainian crisis, plans by the Nordic countries to strengthen their military cooperation, and the latest developments in the dispute between Gazprom and Naftogaz over gas supplies to the Donbass. On the eve of the March 1 meeting in Geneva between the foreign ministers of Russia and the U.S., the centrist Nezavisimaya Gazeta newspaper writes that U.S. Secretary of State John Kerry has threatened Russia with new sanctions, accusing Moscow and the Donbass rebels in eastern Ukraine of violating the recently renegotiated Minsk Agreements. 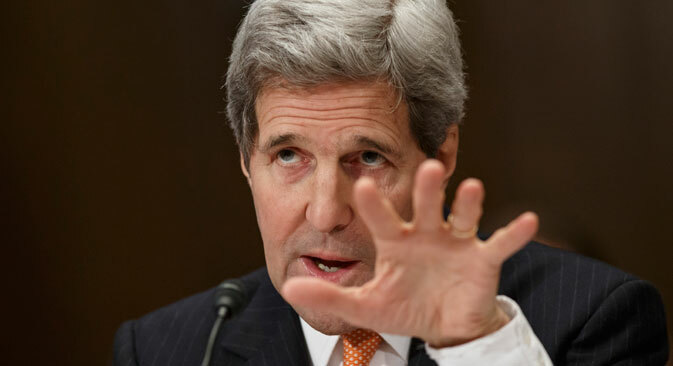 "Plan B includes toughening the sanctions and providing additional support to Ukraine," said Kerry. The U.S. Secretary of State also underlined Russia’s perilous economic situation: "The ruble has fallen by 50 percent, capital flight from Russia amounted to $151 billion and according to forecasts, a recession is looming over the Russian economy." Nezavisimaya Gazeta adds that Kerry did not say which punitive measures are being prepared, but stressed that the U.S. and the EU are united in their sanctions policies. Russian Foreign Minister Sergei Lavrov replied that the threats of new sanctions against Russia in reality only conceal a lack of desire to implement the terms of the latest Minsk peace accord. French Foreign Minister Laurent Fabius spoke about what the West is really afraid of. "We have made it clear to the Russian side that if the separatists launch an attack on [the southern coastal city of] Mariupol, things will change, especially our attitude towards the sanctions," said Fabius. "This will mean that the issue of sanctions will again be raised in the EU." The Kommersant daily business newspaper writes that Norwegian Foreign Minister Ine Marie Eriksen Søreide has announced the country's plans to reorganize its armed forces in order to effectively counter "the Russian threat." Søreide stated that the reason for these steps is the increase in activity by Russian military planes in comparison to the same period last year. However, in an interview with British newspaper The Guardian, Søreide admitted that Russian fighter jets are not violating Norwegian air space. Kommersant writes that the minister has also noticed that Russia is reopening its bases in the far north and added that Norway intends to activate military cooperation with Estonia, Latvia and Lithuania. Military consolidation is also taking place among the Nordic countries: Sweden and Finland have announced their intention to expand military cooperation. According to experts interviewed by Kommersant, the crisis in relations between Russia and the West is not the only reason these countries are strengthening their military capacities. "The reason is the increase of rationalization and effectiveness in the use and organization of the armed forces," said Magnus Christiansson, a lecturer at the Swedish Military Academy. Professor Pavel Baev from the Peace Research Institute in Oslo said that the "closer coordination between neighbors" is related to budget reductions. In Baev's words, government representatives of the Nordic countries stress the danger of "Russian aggression," but in reality Norwegians' relation to Russia remains essentially unchanged. The Expert business magazine writes that Russian gas giant Gazprom is willing not to take prepayment from Kiev for fuel supplied to the war-torn Donbass region of eastern Ukraine, as the European Commission proposed. The issue of gas supplies from Russia to the Donbass has become a pretext for Ukraine’s state oil company Naftogaz to accuse Gazprom of breaching the contract between them and the trilateral agreements reached in Brussels on the so-called Winter Plan gas supplies. At first Gazprom tried to convince its partners that pumping gas through the Ukrainian stations of Prokhorovka and Platovo does not contradict the 2009 long-term contract, but Naftogaz, in order not to pay for supplies to the Donetsk and Lugansk regions, has increased its daily demands for gas selection by 50 percent, writes Expert. General Director of the National Energy Security Foundation Konstantin Simonov explained that Ukraine intended to select a prepaid volume of gas as quickly as possible and force Gazprom to supply gas to eastern Ukraine without a contract. "Russia will not stop gas supplies to the Donbass because it is systematically saving it from a humanitarian catastrophe," said Andrei Listovsky, General Director of the Energy Development Foundation. "It's not clear who will pay for the gas, although this is Ukrainian territory, and the debt will most likely become a matter for the courts to settle."